Note: In 2014 the Otaru Snow Gleaming Festival, or under its new name “Snow Light Path Festival” will be held from February 7~16. For more information on future Snow Light Path festivals, please visit the official website. Unfortunately, the official website is available only in Japanese. For future dates, please leave a comment here or on the HinoMaple Facebook Page around September and I will check next year’s dates. 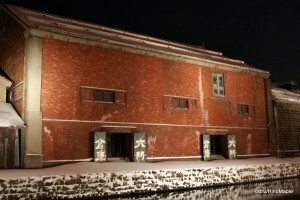 Continuing from my post about Otaru, I feel that the best time to visit Otaru is in the winter. 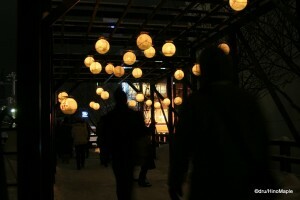 In February, at the same time as the Sapporo Snow Festival, Otaru holds its own winter festival. While it may not be as spectacular, or as grand as, the Sapporo Snow Festival, it is still a very beautiful, and yet, different festival in it’s own right. There are three main areas for the festival, and it’s best to be seen at night. To be honest, I’m not sure why they continue to use the word “gleaming” to describe the festival. While I do agree that it describes the festival very well, and it’s a literal translation of the Japanese title, but I’d probably call it a Snow Candle Festival. 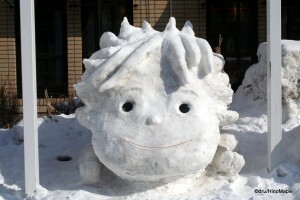 The Snow Gleaming Festival itself has dozens, if not nearly a hundred different snow sculptures. All of them done by various professionals and volunteers. 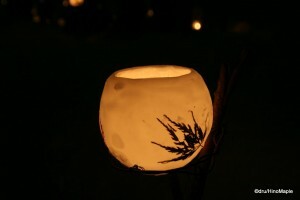 The festival’s sculptures also incorporate a lot of candles, which is where they get the word “gleaming”. Otaru is known for being a romantic city, and this festival definitely lives up to that status. The festival in Otaru can be seen in three main locations. One is along the canal. The canal area tends to be the busiest section of the festival. There is only one side of the canal that has a walkway, while the opposing side has a nice view of the old warehouses. This area of the festival can get very busy as most tour groups tend to come here first. When I visited the festival, they also had a group of carolers singing various songs. It was a little strange to hear upbeat songs, but it did set a good mood. While this area of the festival was very nice, the sculptures weren’t as good as the other two sections. Another section to see sculptures is along Sakai-machi Street. There aren’t as many sculptures along this street, but they are of a better quality than the sculptures along the canal. The sculptures along the canal tend to be original ones with many buildings as a design. Along Sakai-machi, you will have a few artistic designs. In 2009, they had a family setting. Various winter animals were sculpted as a family. You would have a mother and her children, or brothers together. You will also see various different commercial characters such as Hello Kitty, Doraemon, and Anpanman. These are very popular characters in Japan, and you are likely to see more than one of each. 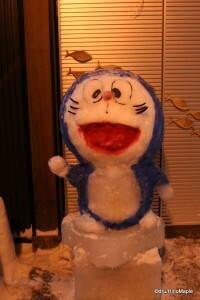 I believe I saw three different Doraemon sculptures all over Otaru. The final place to visit is a park that runs along an old train track. It was the first train line in Hokkaido and the third in Japan. It is impossible to recognize in winter as it’s completely covered in snow. However, the sculptures in this section are the best of the entire festival. As you enter, you will see hundreds of candles lighting the way. It’s a very beautiful and romantic setting that can also be enjoyed by the entire family. Along the way, there are several volunteers at a few sculptures that are there to help you take pictures. This is great for couples and other groups. They usually have two candles in ice that you can hold. You might have to line up at times, but it is worth the short wait. Along the tracks, you’ll also see a few interesting sculptures, lots of flowers and candles encased in ice, and an ice bar. While the ice bar was available in 2009, I can’t guarantee that it would be available in future years. 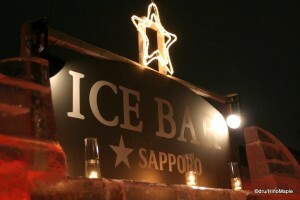 This year, Sapporo had its own ice bar which looked very cool. I wish I had a drink when I was there, but I didn’t want to spend money on it, and it was a little too cold at that time. However, if I had a few days in Otaru, I would definitely enjoy a drink or two. The bottom line is, if you go to Sapporo for their Snow Festival, Otaru’s Snow Gleaming Festival is another festival you must visit. It’s only 30 minutes from Sapporo, and you can return to your hotel in Sapporo very easily. I do recommend visiting the festival in both the daytime and at night, but if you don’t have enough time, you should definitely go at night. It is much better, but also far busier, so be prepared. This entry was posted in Festivals, Hokkaido and tagged Anpanman, canal, candle, candle festival, caroler, caroller, carolling, couples, Doraemon, festival, flowers, gleaming, Hello Kitty, Hokkaido, ice bar, japan, Otaru, Otaru Snow Gleaming Festival, Otaru Unga, Otaru-shi, Ponyo, romantic city, sakai-machi dori, sakai-machi street, sakaimachi, Sapporo, Sapporo Snow Festival, sculpture, snow, Snow Festival, Snow Gleaming Festival, snow sculpture, train track, unga, warehouse by Dru. Bookmark the permalink.